May 2009: 70+ experts in data and semantic web technologies meet in New York and found the Concept Web Alliance (CWA). Initially as a ‘think tank’ to address the big data issue, with a focus on data interoperability and publication. Over 100 experts sign the CWA declaration. NBIC and the Melton Foundation finance the think tank period. The combined working groups is the concept op ‘nanopublication’. A ‘magnet group’ lends its scientific expertise and reputation to the CWA. October 2009: Barend Mons and Jan Velterop introduce nanopublications in Nano-Publication in the e-science era at the W3C HCLS2009 WORKSHOP ON SEMANTIC WEB APPLICATIONS IN SCIENTIFIC DISCOURSE. March 2011: The Open Pharmaceutical Triple Store (Open PHACTS) projects begins. This three year, 22-member project attempts to build a semantic infrastructure for drug discovery, and adopts nanopublications are its data currency. Seven out of 12 Magnet Group members of the CWA are co-applicants or partners in Open PHACTS. This is the first ‘real life’ implementation of nanopublications. April 2011: Nature Genetics publishes an Editorial, a Commentary and a research article about micro-attribution and nanopublications. The nanopub.org website goes online (see this ancient history here). August 2011: The CWA member Leiden University Medical Center hosts an Open PHACTS workshop to define nanopublication standards for the Open Pharmacological Space system. CWA achieves ‘501 c 3’ (not for profit, tax exempt) status in the USA, next to its ‘Foundation’ status in Europe, hosted by the NBIC foundation. 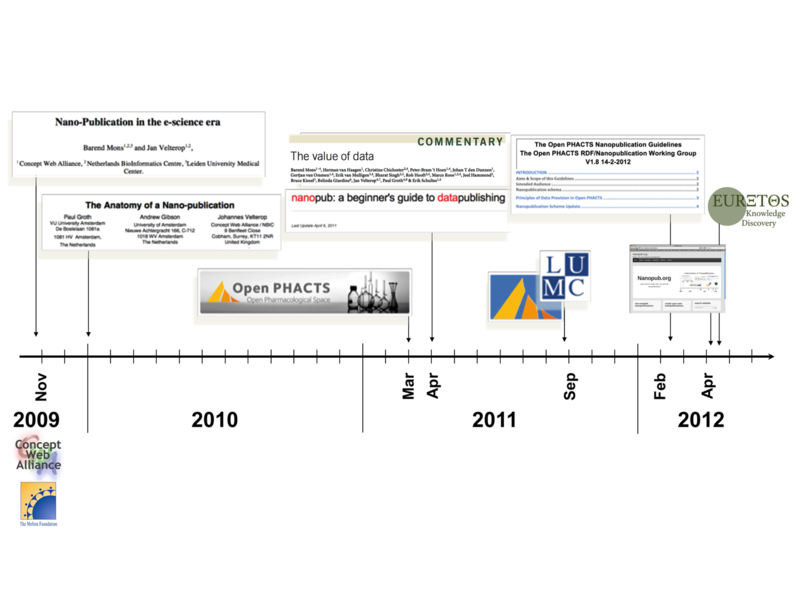 February 2012: Open PHACTS releases its first Nanopublication Guidelines. March 2012: Open PHACTS launches the first version of the Open Pharmacological Space platform for internal Alpha testing. April 2012: After the realisation that the Open PHACTS project is a time limited endeavour, the CWA starts activities to become an executive organisation with the main goals to host the progressive versions of the nanopublication guidelines and to assist the field in turning data into interoperable format. Nanopub.org gets a major upgrade, allowing the community to share and discuss real-world examples of nanopublications. Nanopublication governance is assumed by the Concept Web Alliance. Axton M (2011) Crowdsourcing human mutations. Nature Genetics 43: 279. Mons B et al (2011) The value of data. Commentary, Nature Genetics 43: 281-283. Giardine B et al (2011) Systematic documentation and analysis of human genetic variation using the microattribution approach. Nature Genetics 43: 295-301. Groth P, Gibson A & Velterop J (2010) The Anatomy of a Nanopublication. Information Services & Use 30: 51-56.